prepare 12-cup muffin pan with paper liners or coat with cooking spray. Sift first 6 ingredients into large mixing bowl. Whisk oil, vanilla, egg, and milk until smooth, in medium bowl. Stir moist ingredients into dry ingredients, with wooden spoon (hand mixer not necessary) until just combined. Add coffee and stir until blended well; do not overmix. Gently spoon batter into muffin cups, distributing evenly. 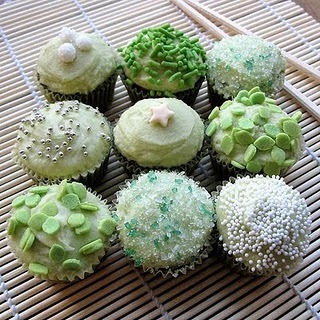 Tuck one Andes mint into each cupcake. Bake for about 25 minutes, until a toothpick inserted in a center cupcake comes out clean. ‍Combine butter and extracts until smooth. Gradually add cocoa-sugar and stir until thick and creamy. Adjust flavor with more sugar or extract(s). This week's post comes right on time for St Patrick's Day, so let me start by wishing everyone the Happy Luck of the Irish and reminding you to wear something - or better - to eat something green! If you're stumped as to what that ought to be, may I gently suggest some homemade cupcakes topped with either green icing, deco-sugar, or candies?! Try one of my favorite chocolate cake recipes morphed into cupcakes that have a simple chocolate-mint twist, at the end of this post. If you'd rather have someone else do the baking, our favorite Cake Maestra Chrysta Wilson is busy as usual and at your service at Kiss My Bundt Bakery. This week (even perhaps all month; all cakes are available to order) she'll have specialty cakes that range from "Green Velvet" (which we hope to sample on our tour!) to Bailey's Irish Cream to pound cake drizzled with a fantastic Irish Whiskey glaze ... and that probably is just the beginning; she never ceases to amaze us. Become their fan on Facebook and follow them on Twitter to be in-the-know this week and at all times! Menu items that are "wallet friendly"
Now is the perfect time to chat up the "green" restaurant owned by Jesse James (husband of Oscar-winning actress Sandra Bullock). In Long Beach, next to his world-famous West Coast Choppers motorcycle store, sits Cisco Burger. I am always on a great burger hunt (she writes, as swimsuit season approaches ...) and I can't wait to check this one out. There is lots to love about them besides their simple handcrafted/homemade menu items that are "wallet friendly", and made with farm-fresh and local ingredients. Their hybrid delivery car brings goods home from their mostly solar-powered facilities, they participate in local recycling, and all packaging containers are biodegradable paper products. There is no drive-thru at this "old world hamburger stand with a modern eco-friendly philosophy", but surely enough allure to call a crowd to their breakfast and lunch tables, 7 days a week! And speaking of allure, sweeten the day of your favorite loved one(s) with this recipe, and enjoy the good luck that will inevitably yield! Wishing you and yours the best of fun, love, and luck around the table this week!